Our first stop on our Holiday Give Back tour this year is Kiva!!!! Years ago, I started with my first Kiva loan. Since then, I have made 11 loans. Last year, each of my kids received a $25 gift card to Kiva, and what fun we have had this year! 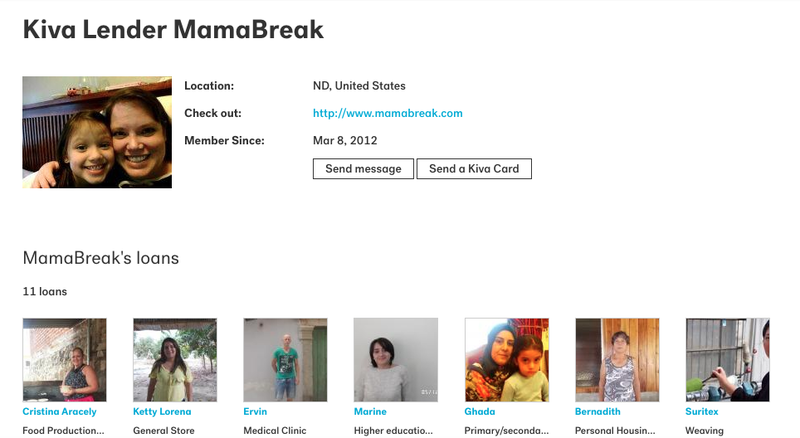 We kept everything housed under my Kiva account, and the kids each spent time reviewing different people needing loans. My oldest gave her loan to a textile store, my son donated bulls, and my daughter helped pay the tuition for another child to attend school. We log in each month to see the progress of our loan, and have been able to make additional loans (as what we loaned out was paid out). Kiva is a great way for kids to connect to the world around them. We checked out books on the "home" countries of our loans, and read more about each location. It has been fun, educational, and a great way to give back! It only costs $25 to make your first loan, and when that loan is paid back, you can reinvest your funds into a new loan!